latest interview: Mini Mansions - 2018 USA photo diary. Diary Photo Diary: Lennon Stella's very first live show. 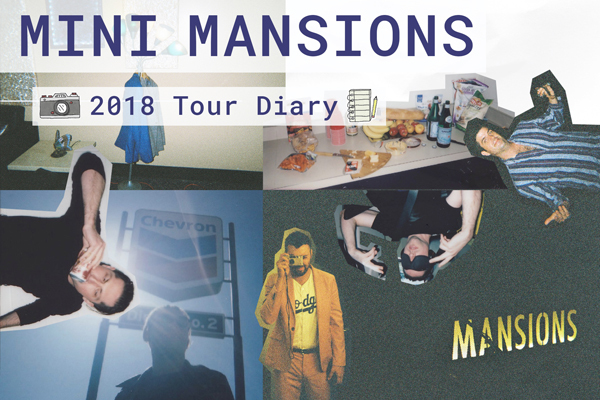 Diary Mini Mansions - 2018 USA photo diary. Diary The Japanese House - 2018 UK photo diary. Diary Donna Missal - Austin City Limits 2018 photo diary. Diary Wallows - Austin City Limits 2018 photo diary. Music Photo Diary: Pale Waves' 2018 Australia + New Zealand tour. Music Photo Diary: Lauv’s 2018 New Zealand tour. Diary Premiere + Photo Diary: Annalia’s 'Dust' music video. Music Interview + Photo Diary: Billie Eilish x Laneway 2018. Diary Photo Diary: Cloves - A Day In The Life. Diary Photo Diary: Julia Jacklin x NZ, June 2017. Music Photo Diary: Laneway 2017 x Glass Animals. Music Tourope 2016: Photo Diary - The Japanese House. Diary The Impossible Project x Coup De Main 2015! Diary Thomston: Journal Murica ~ part 3 - NYC. Diary Thomston: Journal Murica ~ part 2. Diary Thomston: Journal Murica ~ Part 1. Diary Exclusive: My Chemical Romance - 2012 Big Day Out photo diary!